On Sunday all three U.S. drivers completed the cones phase of the FEI World Driving Championships for Singles, securing a sixth place team finish. This strong finish demonstrated a marked improvement for the U.S. Driving Team after having placed 11th at the 2010 World Championships .Leading the U.S. individually was Sterling Graburn, who completed his second World Championship in 22nd place. Germany claimed the Team Gold medal, while Switzerland grabbed Silver and The Netherlands took Bronze. Top Individual honors went to Germany’s Christoph Dieker, with Silver and Bronze going to Michael Barbey of Switzerland and The Netherland’s Wilbrord Van Den Broek respectively. Graburn (Georgetown, KY) and Larry Denny’s Ulano rebounded from a disappointing first phase that saw them down the order to secure a top 25 placing. 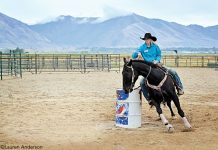 The 11-year-old Dutch Harness gelding completed the cones phones adding just 6.29 penalties after knock-downs at obstacles four and fourteen in addition to adding .29 points for exceeding the time allowed. The combination finished on a score of 144.55. Donna Crookston (Saltsburg, PA) narrowly edged Graburn in the final phase adding just six penalties to her overall score. Driving her own RG Cowboys Black Cadillac, Crookston faulted at obstacles two and sixteen. The 16-year-old Morgan gelding completed the Championships on a score of 147.87 in 32nd place. Leslie Berndl (Newcastle, CA) was the third driver for the U.S. finishing in 36th place with a score of 151.70. In the cones phase Berndl and Fritz Grupe’s 11-year-old KWPN gelding Uminco added 14.66 to their score. 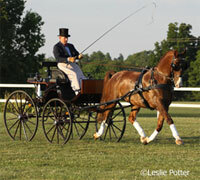 For results from the 2012 FEI World Driving Championships click here. Previous articleNational Show Horse Finals under way in Springfield, Ill.
Congratulations to the winners, and Good Luck to Everyone!! Congratulations! Such a fun sport!